This kimono-inspired summer dress Kiva gets you in the mood for long, summer strolls along the beach or through the city. It feels light on your skin and also looks beautiful on special occasions. 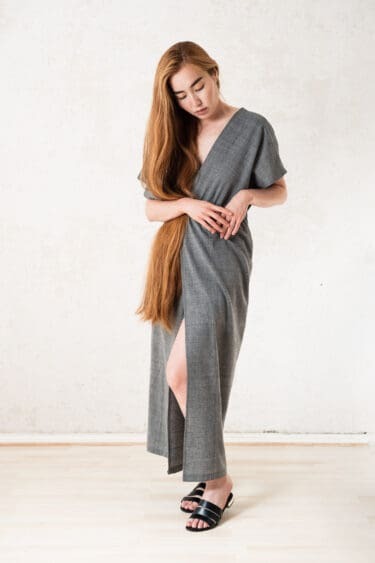 The cut of this dress is zero-waste, which means that there are not cuts left and therefore none of the fabrics ends up being wasted. The black-white Ikat fabric is handwoven in the small Indian hamlet Pochampally in the state of Telangana. Traditional Ikat fabrics are produced there, requiring refined weaving technique and precise dyeing skills that have been honed by generations of inherited knowledge, as well as a lot of talent and concentration. The wonderfully soft, patterned fabrics are made available to us by the Indian fashion label Translate , who are dedicated to the revival of the Ikat craft. Kiva was cut and sewn in our stitching workshop in Chittapur. This lightweight top is the one and only thing we want to wear on hot summer days. The length of the straps you can adjust individually, just how you prefer. Wear it during the day or through neverending nights, we know this top will soon be an unmissable item in your closet! The patterned cotton fabric is handmade by weavers of the family run business of Vankar Kantilal Samat. By Traditionally manufactured on the loom and treated with a special finishing, the fabric becomes very soft, thus comfortable to wear and does not crease easily. Woven by hand the fabric contains small irregularities, which contribute to its unique structure. Thus, each meter of this valuable material has its very own look. Finally, Tana is sewn in our workshop in Chittapur. We promise you, in this loose and light jumpsuit you can jump around perfectly! Also lying on the grass, strolling through the park or dancing wildly at night is no problem. Because like most of our garments, you can wear it to special occasions as well as day to day. The light-grey Ikat fabric is handwoven in the small Indian hamlet Pochampally in the state of Telangana. Traditional Ikat fabrics are produced there, requiring refined weaving technique and precise dyeing skills that have been honed by generations of inherited knowledge, as well as a lot of talent and concentration. The wonderfully soft, patterned fabrics are made available to us by the Indian fashion label Translate , who are dedicated to the revival of the Ikat craft. Jalina was cut and sewn in our stitching workshop in Chittapur. This slightly wider cut shirt Sarala brings color into your life! The combination of the casual cut and the warm bright color makes it the perfect everyday companion. Not least thanks to the soft, high quality silk fabric, Sarala is absolutely a feel good piece. With this shirt you are looking forward to a carefree summer! This special cotton/silk weave is made by the Indo-German Social Enterprise Cocccon, which works with cotton and peace-silk in the rural areas of Jharkand. The so called Peace-Silk is produced without harming the lives and habitat of the silkworms and dyed with environmentally friendly colors. Finally, Sarala is sewn in our workshop in Chittapur. Dress Koel definitely convinces with its low-necked backpart and is simply the perfect summerdress! The straps can be individually adjusted and worn in different ways. The beautiful silk textile makes the dress even more special! This light-green cotton is handmade from weavers cooperating with the social enterprise Moral Fibre. The fabric is hand-dyed. Traditionally manufactured on the loom, the fabric contains small irregularities, which make their contribution to its unique structure. Thus each meter of this valuable material has its very own character. Finally, Koel gets sewn in our workshop in Chittapur. Combined with a light shirt, chic blouse or tights and boots – in this classic skirt you will be prepared for all (weather) situations. The elastic waistband on the back makes sure the skirt fits perfectly around your waist and it, of course, also has side pockets. This light green cotton is handmade from weavers cooperating with the social enterprise Moral Fibre. The fabric is hand-dyed. Traditionally manufactured on the loom, the fabric contains small irregularities, which make their contribution to its unique structure. Thus each meter of this valuable material has its very own character. Finally, Raju gets sewn in our workshop in Chittapur. 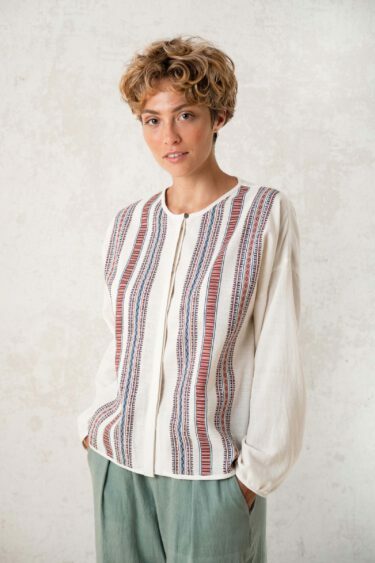 Worn buttend-up to skirt or pants, or just quickly thrown over a dress: this blouse keeps you warm when there is a breeze but is still light and soft for warmer days. This ruby cotton fabric is woven by hand in a cooperative part of the organization Dastkar Andhra. Traditionally manufactured on the loom, the fabric contains small irregularities, which contribute to its unique structure. Thus each meter of this valuable material has its very own character. Finally Rajni gets sewn in our workshop in Chittapur. The dark-grey Ikat fabric is handwoven in the small Indian hamlet Pochampally in the state of Telangana. Traditional Ikat fabrics are produced there, requiring refined weaving technique and precise dyeing skills that have been honed by generations of inherited knowledge, as well as a lot of talent and concentration. The wonderfully soft, patterned fabrics are made available to us by the Indian fashion label Translate , who are dedicated to the revival of the Ikat craft. Kiva was cut and sewn in our stitching workshop in Chittapur. This blue cotton is handmade from weavers cooperating with the social enterprise Moral Fibre. The fabric is hand-dyed. Traditionally manufactured on the loom, the fabric contains small irregularities, which make their contribution to its unique structure. Thus each meter of this valuable material has its very own character. Finally, Raju gets sewn in our workshop in Chittapur. The black and white Ikat fabric is handwoven in the small Indian hamlet Pochampally in the state of Telangana. Traditional Ikat fabrics are produced there, requiring refined weaving technique and precise dyeing skills that have been honed by generations of inherited knowledge, as well as a lot of talent and concentration. The wonderfully soft, patterned fabrics are made available to us by the Indian fashion label Translate , who are dedicated to the revival of the Ikat craft. Finally, Tana is sewn in our workshop in Chittapur. The rust-colored silk fabric is handmade by families from Assam in the region around Guwahati and is provided to us by our partner 7Weaves . The so called Peace-Silk is produced without harming the lives and habitat of the silkworms and dyed with natural colors. Traditionally manufactured on the loom and woven from handspun yarn, the fabric contains small irregularities, which contribute to its unique structure. Thus, each meter of this valuable material has its very own look. Finally, Koel is sewn in our workshop in Chittapur. This special cotton/silk weave is made by the Indo-German Social Enterprise Cocccon, which works with cotton and peace-silk in the rural areas of Jharkand. The so called Peace-Silk is produced without harming the lives and habitat of the silkworms and dyed with environmentally friendly colors. Finally, Tana is sewn in our workshop in Chittapur. These pants will be your new favorite! Because of the soft, lightweight fabric and the elastic waistband, pants Chetana are super comfortable, fit all kinds of different body types and look great with sandals, sneakers of ankle boots. These pants will be your new favorite! 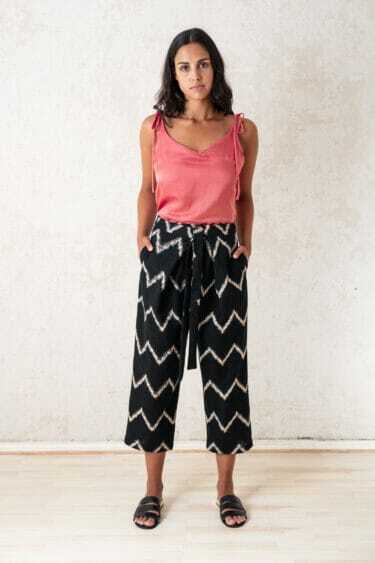 Because of the elastic waistband and soft, lightweight fabric – pants Chetana are super comfortable, fit all kinds of different body types and look great with sandals, sneakers of ankle boots. The rust-coloured silk fabric is handmade by families from Assam in the region around Guwahati and is provided to us by our partner 7Weaves . The so called Peace-Silk is produced without harming the lives and habitat of the silkworms and dyed with natural colors. Traditionally manufactured on the loom and woven from handspun yarn, the fabric contains small irregularities, which contribute to its unique structure. Thus, each meter of this valuable material has its very own look. Finally, Bilan is sewn in our workshop in Chittapur. The dark grey Ikat fabric is handwoven in the small Indian hamlet Pochampally in the state of Telangana. Traditional Ikat fabrics are produced there, requiring refined weaving technique and precise dyeing skills that have been honed by generations of inherited knowledge, as well as a lot of talent and concentration. The wonderfully soft, patterned fabrics are made available to us by the Indian fashion label Translate , who are dedicated to the revival of the Ikat craft. Weena was cut and sewn in our stitching workshop in Chittapur. When a german-indian fair fashion label and a fair fashion blogger get together to design a piece of garment, this beautiful wrap blouse is the result. 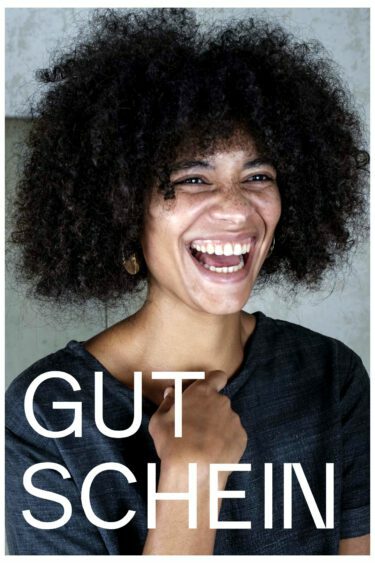 The blouse is ecologically and socially sustainable and also wearable in different ways. The blogger Mia from „heylilahey“ has already been looking for a long time for the possibility to create a favourite piece of clothes which meets all her requierments. Along this journey she has found in Jyoti – Fair Works the perfect partner to fulfil this vision. The wrap-blouse Winu gets sewn by the women working together with Jyoti in India and is made of handwoven cotton and peace-silk. Moreover this design underlies a zero-waste-cut. Because of the different ways how to wear the blouse, Winu will be a longlasting companion. Design: Wearable with a V-neck on the back, as a cardigan or crossed on the front. Individually wrapable. Additional stability through an attachable band in the shoulder area. When a german-indian fair fashion label and a fair fashion blogger get together to design a piece of garment, this beautiful wrap blouse is the result. The blouse is ecologically and socially sustainable and also wearable in different ways. The blogger Mia from „heylilahey“ has already been looking for a long time for the possibility to create a favourite piece of clothes which meets all her requierments. Along this journey she has found in Jyoti – Fair Works the perfect partner to fulfil this vision. The wrap-blouse Winu is sewn by the women working together with Jyoti in India and is made of handwoven cotton and peace-silk. Moreover, this design underlies a zero-waste-cut. Because of the different ways how to wear the blouse, Winu will be a longlasting companion. This special cotton/silk weave is made by the Indo-German Social Enterprise Cocccon, which works with cotton and peace-silk in the rural areas of Jharkand. The so called Peace-Silk is produced without harming the lives and habitat of the silkworms and dyed with environmentally friendly colors. Finally, Winu is sewn in our workshop in Chittapur. Finally! Our classic shirt Himat but in a slim fit version! The darts give the shirt a slightly tighter fit, so if you are tall and have a small waist and hip, this shirt will be your new favorite. 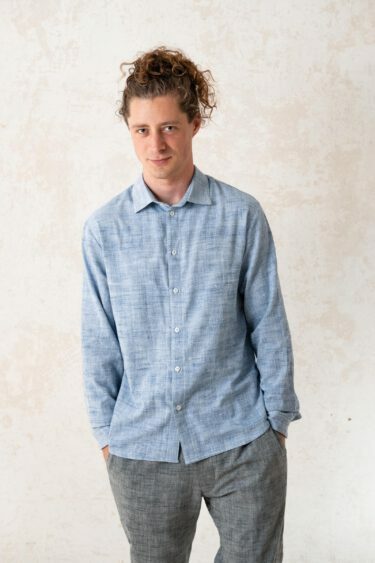 This lightblue cotton is handmade from weavers cooperating with the social enterprise Moral Fibre. The fabric is hand-dyed. Traditionally manufactured on the loom, the fabric contains small irregularities, which make their contribution to its unique structure. Thus each meter of this valuable material has its very own character. Finally, Hilu gets sewn in our workshop in Chittapur. Finally! Our classic shirt Harish but in a slim fit version! The darts give the shirt a slightly tighter fit, so if you are tall and have a small waist and hip, this shirt will be your new favorite. This lightblue cotton is handmade from weavers cooperating with the social enterprise Moral Fibre. The fabric is hand-dyed. Traditionally manufactured on the loom, the fabric contains small irregularities, which make their contribution to its unique structure. Thus each meter of this valuable material has its very own character. Finally, Hamu gets sewn in our workshop in Chittapur. Our jacket Jadu is inspired by a laid-back Blazer but is still elegant. 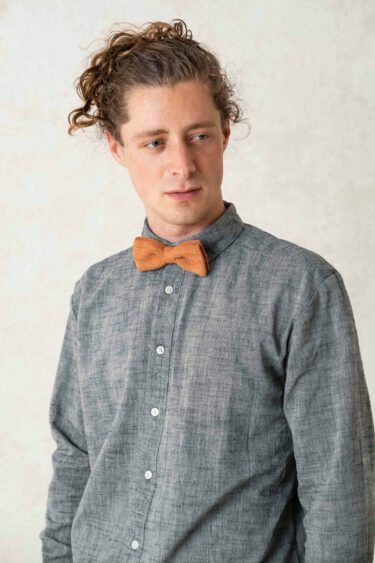 Wear it with a shirt and bow tie and you are ready for a fancy event where you still want to feel relaxed. Or you can just throw it over your beach outfit when it finally starts to cool down in the evening. This blue cotton is handmade from weavers cooperating with the social enterprise Moral Fibre. The fabric is hand-dyed. Traditionally manufactured on the loom, the fabric contains small irregularities, which make their contribution to its unique structure. Thus each meter of this valuable material has its very own character. Finally, Jadu gets sewn in our workshop in Chittapur. The loose-fitted Hanuman ist a light pair of pants which handwoven fabric lays softly on your skin. You can roll them up around the ankel which make them the perfect pants for summer! 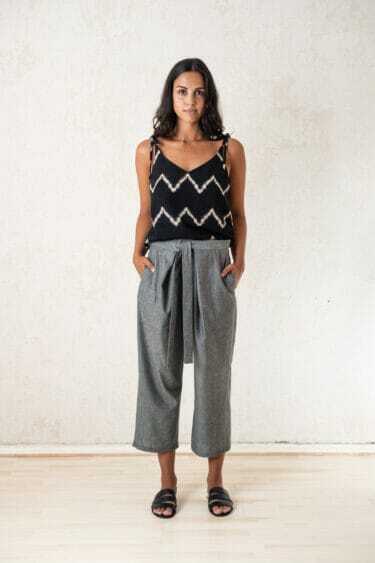 This grey cotton is handmade from weavers cooperating with the social enterprise Moral Fibre. The fabric is hand-dyed. Traditionally manufactured on the loom, the fabric contains small irregularities, which make their contribution to its unique structure. Thus each meter of this valuable material has its very own character. Finally, Hanuman gets sewn in our workshop in Chittapur. 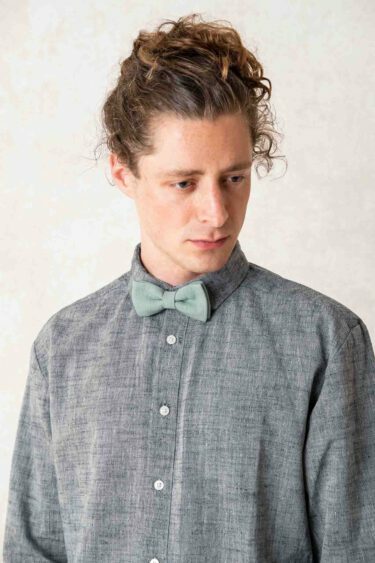 With this bow tie there is no doubt that you are perfectly dressed for every special occasion, as for example christmas, new years eve or grandma’s 80th birthday. 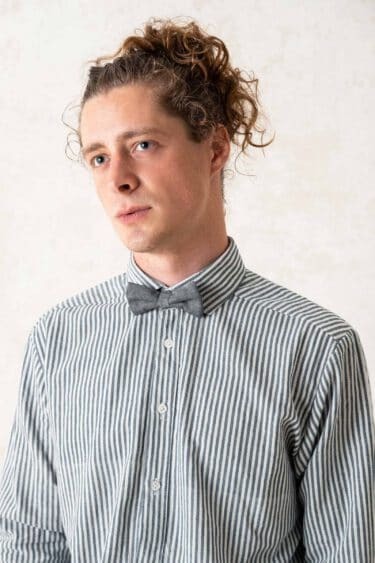 The bow tie looks wonderful and is put on quickly: a little hook makes it possible to adjust your neck circucmference and an elastic band makes it comfortable to wear. This light greencotton is handmade from weavers cooperating with the social enterprise Moral Fibre. The fabric is hand-dyed. Traditionally manufactured on the loom, the fabric contains small irregularities, which make their contribution to its unique structure. Thus each meter of this valuable material has its very own character. Finally, Farin gets sewn in our workshop in Chittapur. The darkgrey Ikat fabric is handwoven in the small Indian hamlet Pochampally in the state of Telangana. Traditional Ikat fabrics are produced there, requiring refined weaving technique and precise dyeing skills that have been honed by generations of inherited knowledge, as well as a lot of talent and concentration. The wonderfully soft, patterned fabrics are made available to us by the Indian fashion label Translate , who are dedicated to the revival of the Ikat craft. Farin was cut and sewn in our stitching workshop in Chittapur.